A reporter described the scene from inside the building of a Maryland newsroom where an active shooting opened fire on employees as a "war zone." 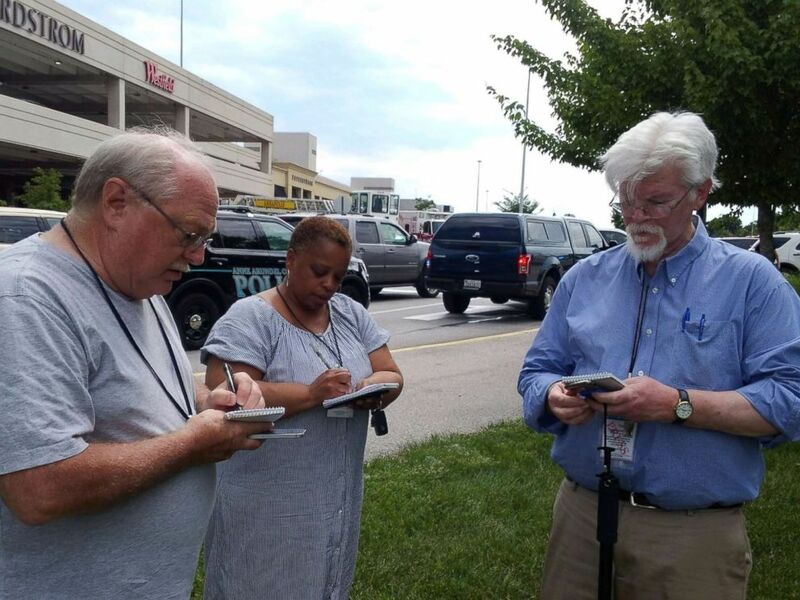 Interested in Maryland Newspaper Shooting? Add Maryland Newspaper Shooting as an interest to stay up to date on the latest Maryland Newspaper Shooting news, video, and analysis from ABC News. Phil Davis, a courts and crime reporter for the Capital Gazette, a daily Annapolis newspaper, wrote that a single gunman shot through the glass door to the office and then opened fired on employees. Davis said he was taking cover under his desk when he heard the gunman reload after shooting several people. Davis said that he was tweeting while waiting to be interviewed be police. "Can't say much more and don't want to declare anyone dead, but it's bad," he wrote. In an account published on the Gazette's website, Davis described the scene as a "war zone" and said he and others were still hiding under their desks when the shooter stopped firing, adding that he doesn't know why the gunman stopped. Maryland police officers patrol the area after multiple people were shot at at The Capital Gazette newspaper in Annapolis, Md., June 28, 2018. Police then arrived at the scene and surrounded the shooter, he said. "I’m a police reporter. I write about this stuff — not necessarily to this extent, but shootings and death — all the time," Davis said. "But as much as I’m going to try to articulate how traumatizing it is to be hiding under your desk, you don’t know until you’re there and you feel helpless." ABC News has not been able to confirm Davis' employment with the paper, but the Baltimore Sun, which owns the Gazette, is using his reporting. Capital Gazette Editor Jimmy DeButts tweeted that he is "devastated" and "heartbroken" over the shooting, praising his reporters and editors who "give all they have every day" and have a "passion for telling stories from our community." Anthony Messenger, an intern for the newspaper, pleaded for help on Twitter, saying there was an active shooter in the building. 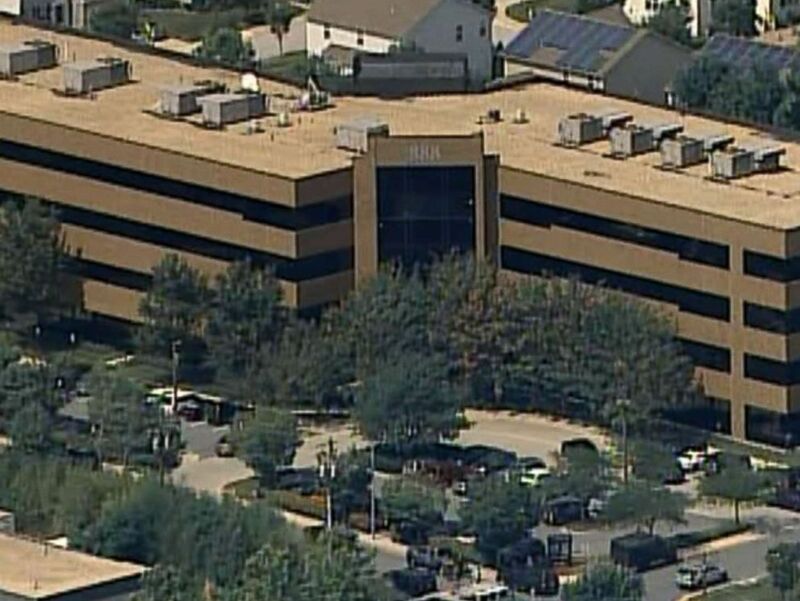 The Anne Arundel Police Department confirmed that an active shooter was at the building. Five are dead and two were injured. A suspect is now in custody, police said. 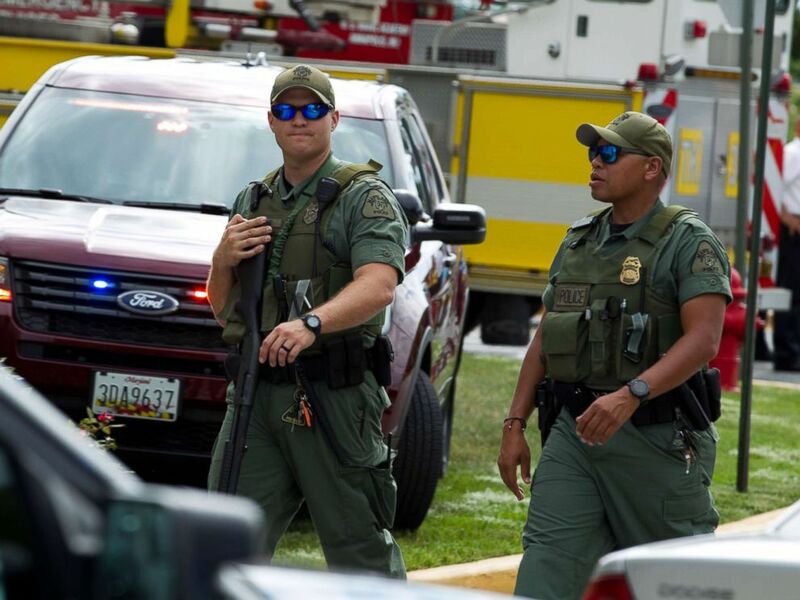 First responders gather after reports of a shooting in the offices of the Capital Gazette in Annapolis, Md., June 28, 2018. Pat Furgurson, another reporter for the Capital Gazette, was across the street when he received a call from the Baltimore Sun news desk, warning him not to return to the newsroom, he told ABC News. Capital Gazette journalist E.B. "Pat" Furgurson III takes notes with two other people as police officers respond to a shooting inside Capital Gazette offices in Annapolis, Md., June 28, 2018. Employees were led from the building with their hands up and were brought across the street to a reunification center at the Annapolis Mall, where they were interviewed by authorities, Furgurson said. Other offices in the building include offices for doctors, lawyers and an orthodontist, Furgurson said. Bill Wagner, a Capital Gazette reporter who covers Navy sports, tweeted that he was safe. Tom Marquardt, the former Editor of the Capital Gazette for 35 years, told ABC News he still has a lot of friends who work there and that the "suspense is really terrible" as he waits for news on what happened to them. An office building at 888 Bestgate Road in Annapolis, Md., is pictured after reports of a shooting on June 28, 2018. Marquardt said the newsroom is on the ground floor and described it as being a very open room. Newspaper staff had dealt with threats in the past and have always been concerned about security, Marquardt said, adding that angry readers in the past threatened the newspaper over who it endorsed for an election. Marquardt personally got threats, as did others, but they were mostly anonymous, he said. More than four years ago, he said he had called the Anne Arundel Police Department to alert them to threats from the alleged gunman, identified by law enforcement sources to ABC News as Laurel, Maryland, resident Jarrod Ramos. The police department did not release his identity. The Society of Professional Journalists released a statement saying it is "deeply sadded" by the reports of the shooting. 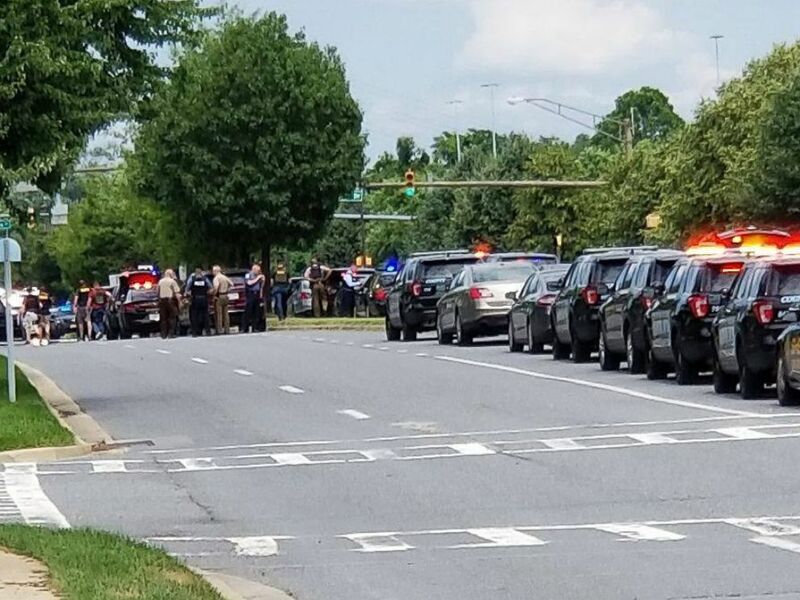 One witness who works in the office across from the Gazette told WJLA that he saw the gunman pointing a "big shotgun" into the office, "like he was targeting people." "I saw him move across the entrance of the office," the witness said. The man said he only looked at the shooter "for a second" before he ducked his head behind the wall. Police got to the scene within minutes and escorted them out of the building, the witness said.